A Gantt Chart is a way to graphically show progress of a project. It outlines all activities involved in a project and illustrates other project-related information such as: the start and finish dates of activities, completion percentages, responsible persons, and so on. 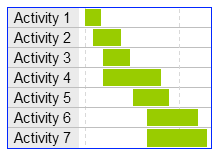 Gantt charts are useful to keep the team and other relevant stakeholders informed of the progress of the project. This template comes in different variations, one that generates the gantt chart automatically after entering the start dates and the durations of activities, and two that require you to manually construct the chart. All templates require that you first enter the list of activities, the start date, and the expected end date for the entire project. These templates can be modified for your own use and depending on your specific needs. For example, you may want to add more rows to include more activities, or add more columns if you want to add more attributes or if you need to expand the timeline. Additionally, activities could be described as main or sub using the ID column or by manually applying different colors and formatting to the activity list. If you will have any difficulties customizing these templates or you lack time to do so, we will be happy to perform the customization for you. Let us know what you need and we’ll do our best to serve you. Please help us to make this template better by providing us with your comments or suggestions.